Counting the days until we are in our beloved Iceland once more, hopefully with you! Knitting and cooking classes, soaking in geothermal bliss, meeting Icelandic knitters, fantastic food, seeing the magnificent landscape, and feeling at home sweet home in our Reykjavik hotel…we can’t wait to return. And this year we’re adding a 3-day excursion to East Iceland where the reindeer live! 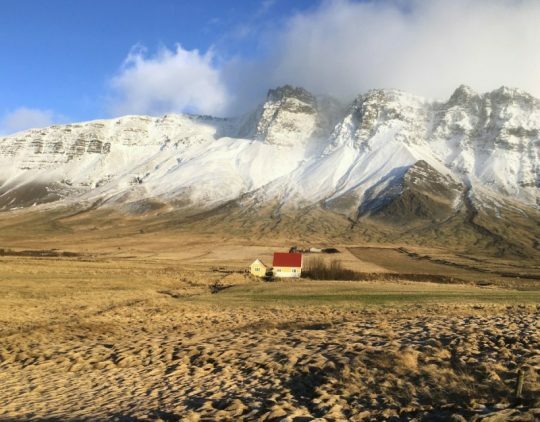 This will be our fifth winter trip to Iceland, inspired by our Icelandic friend Valdi, who, thank goodness, never gave up trying to convince us that winter is the ideal season to visit. We and our travelers of the past two years agree with him whole-heartedly. It’s much less crowded and not all that cold—and indeed, during the same dates for the past two years, temperatures have varied from 23 to 46 degrees Fahrenheit. The sky begins to lighten at about 9:30 in the morning and darkens around 5. By the end of our ten-day adventure we’ll actually have about an extra hour of daytime, because at the end of January daylight increases by almost 6 minutes per day. The slow metamorphosis from between darkness and light, twice a day, is mesmerizing. We love Iceland in winter! Here are all the details: *Iceland 2020 PDF (a PDF)…feast your eyes and your heart and we hope you will be with us in 2020.